Read on to learn why you ought to consider including a handy pot filler as part of your next kitchen remodeling project. If you’re planning a kitchen remodel, one feature to consider adding is a pot filler. These handy fixtures are basically additional cold water faucets installed right over the stove, making it easier and safer to fill large pots. Even if your sink isn’t far from the stove, it’s still a chore to fill a large pot and haul it over to the burners. Water weighs eight pounds per gallon, so even a two-gallon pot can weigh almost 20 pounds when full. With a pot filler mounted above your range, you just extend the fixture out from the wall and fill your pot while it’s sitting right on the burner. 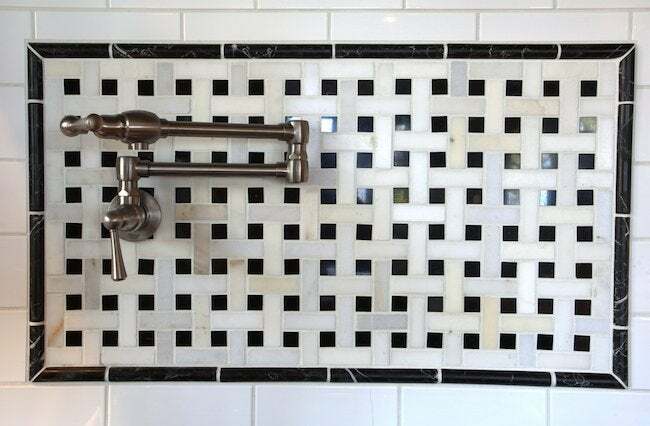 You’ll probably want to coordinate your pot filler with your sink’s faucet. Many manufacturers create matching or complementary styles to go with their faucet sets. Be sure to measure carefully before choosing a pot filler—the arm needs to clear the top of your range without hitting the cabinet above it, and you don’t want it mounted so high that water splashes out of the pot when you fill it. Pot fillers do require a new supply line, and the fixtures themselves can be pricey, so this is not an inexpensive addition. Still, as part of a larger remodel, the cost is usually not prohibitive, and once you’ve had one, you’ll wonder how you ever did without it.